Pictured in photo, from left to right: Deborah S. Breck, Partner, Pullman & Comley; Maria Xavier-Dowski, Human Resources Director, Optimus Health Care; Alix Pose, Quality Assurance/Performance Improvement Coordinator, Optimus Health Care; Maribel Rivera DeNapoleon, Dental Practice Manager, Optimus Health Care; Nancy D. Lapera, Partner, and Chair, Women’s Leadership Initiative, Pullman & Comley; and Alexandra McGoldrick, Grants Administrative Manager, Optimus Health Care. 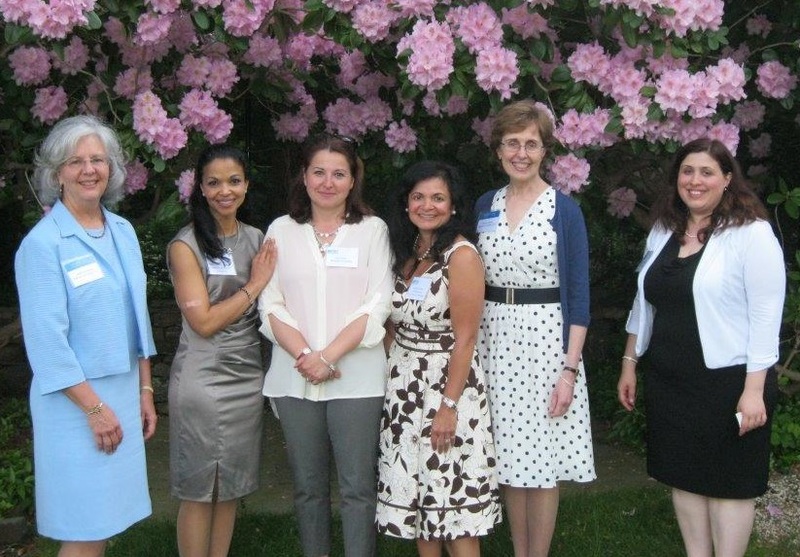 DARIEN, Connecticut: The Women’s Leadership Initiative at Pullman & Comley held its 2015 Networking Tea at the Meadowlands estate in Darien on May 27. Now in its 18th year, the annual event hosted by the law firm provides an opportunity for women professionals to network while also supporting the work of a local nonprofit organization. This year’s event highlighted the work of Optimus Health Care. Optimus Health Care provides complete primary care services and health education to residents of communities in Southwestern CT, particularly the medically underserved, in a culturally sensitive manner, regardless of their ability to pay. Optimus offers primary care services to both adults and children including internal medicine, family practice, OB/GYN, Pediatrics, Dentistry, specialty services and school based health centers. Donations made in association with the Tea were earmarked for Optimus programs benefitting women and young children. For additional information, please visit: https://optimushealthcare.org. Pullman & Comley’s Women’s Leadership Initiative (WLI) is committed to fostering an environment that supports the professional advancement of women at the firm, while also seeking to enrich the lives of women in our local communities. Through networking events and substantive discussion programs, the WLI creates opportunities for building relationships , providing leadership and mentoring, supporting numerous women- and family-focused organizations and nonprofits, and raising awareness for important topics with a larger community of women. With nearly 90 attorneys, Pullman & Comley, LLC is one of Connecticut’s largest firms and provides a wide range of legal services to clients in the New England region, as well as throughout the United States and internationally. The firm’s major practice areas include business organizations and finance; environmental and land use; government finance; health care; labor, employment law and employee benefits; litigation; property valuation; real estate; regulatory, energy and telecommunications; and trusts and estates. The firm has offices in Bridgeport, Hartford, Stamford, Waterbury and White Plains. The firm is an active member of the Law Firm Alliance, an international affiliation of law firms. For more information, please visit http://www.pullcom.com.